I bought this to make my raw prep easier. I currently have 6 dogs so prep takes FOREVER. I also breed and wean puppies onto raw so ground meat is usually better in the beginning, but since puppies have to be fed balanced meals every time I was stuck with kibble…until now! This grinder cut my prep time way down and made portioning SO much easier. I just bought a giant rubbermade tote and I grind everything into it for all 6 dogs and the puppies, mix it up, and then portion it out. It takes longer to weigh and bag it than it does to grind it! This grinder worked flawlessly! The best investment I’ve made in a long time. The only thing I will say is be wary of Amazon’s suggestion to buy the meat lug along with the grinder. It doesn’t fit under the neck! 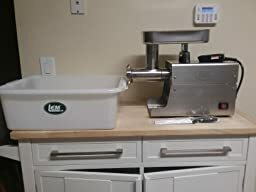 You won’t be able to have the grinder and the lug on the same counter/table you will have to hang the grinder off of the counter and put the lug on a lower surface somehow. LEM didn’t think that one through. Luckily I have an island with wheels I just put the grinder on the island and the lug on the table. But if you don’t have a setup like that you might want to find a lug that is shorter. DO buy the foot pedal though if you’re going to be doing a lot of starting and stopping or pausing to reload the meat pan! What a workhorse this is! I ground up 90 pounds of chicken in under 30 minutes. A real time saver and worth every penny. Don’t waste your money on cheap grinders, you’ll just end up buying a LEM!